The Drovers Project is a two year project managed by Northumberland National Park Authority with partnership funding from the Heritage Lottery Fund, the Countryside Agency, English Nature and the National Trust. Started in 2003 the project has now been running for just over a year, and is set to draw to a close in May 2005. The project aims to highlight the value of traditional breeds of cattle in grazing for conservation value on sites of key natural habitats. These traditional breeds include the Galloway, Blue Grey, Whitebred Shorthorn and others. These breeds are distinctive in their appearance and as such contribute to the local character of Northumberland. The Blue Grey in particular formed the majority of upland suckler herds in the National Park area about 40 years ago, popular due to their hardy character and ability to do well on poor pasture with minimal supplementary inputs. However, in recent years, traditional cattle breeds have been largely overshadowed by continental breeds such as the Charolais, Simmental and Limousin. A traditional breeds survey undertaken as part of the Drovers project revealed the extent of the decline in numbers of our native cattle breeds. Continental cattle, with their leaner appearance and faster maturing attributes were felt to be better suited to the changing beef production systems and markets. Although popular with many farmers from a commercial viewpoint, these breeds are less able to maintain the nature conservation value of key habitats found within the National Park, such as upland mires and areas of heather regeneration. As such, traditional breeds have developed a vital new role in helping to maintain the biodiversity of the uplands through grazing sites for conservation objectives, such as those within the Drovers Project. At the forefront of such work are the Galloway and its cross the Blue Grey, widely regarded as being unrivalled as conservation grazing animals, and increasingly being recognised for their ability to graze rough grassland habitats in particular. 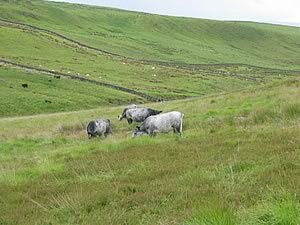 The broader grazing preferences of breeds such as the Blue Grey reduce the cover of rank grasses such as Purple Moor Grass and open up the sward to encourage greater species diversity. The first site to be grazed under a Drovers project agreement was Cragend on Hotbank Farm, in the Hadrians Wall area of the National Park. This site has now been grazed for two seasons, for a period of 10 weeks each. The objective for this site has been to use Galloway and Blue Grey cattle to reduce the dominance of Purple Moor Grass (Molinia caerulea) in order to open up the vegetation sward to allow greater species diversity and to encourage heather regeneration. Purple moor grass is only palatable for a short length of time during the summer, generally June to September, hence the relatively short grazing period. After this time it becomes dry and coarse and cattle will move onto other vegetation, which may lead to damage to heather etc, so the cattle are removed from the site at this stage. As part of the project we are undertaking monitoring of the cattle behaviour on site through daily records of location and activity during the grazing seasons. This information allows behaviour patterns to be identified and assessments of how different parts of the sites are being used by the cattle. 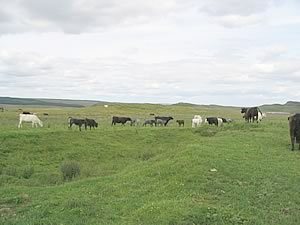 Once the cattle are removed from the sites post-grazing vegetation monitoring is undertaken. The results from this are compared with baseline data for the sites, where available, and to results from last year to infer conclusions regarding the impact the cattle have had on the sites. So far results have been promising, with the cattle having a considerable impact upon the rank grass species such as purple moor grass and causing little damage to sensitive habitats such as mires. The Drovers project is also aiming to research the cultural associations of such traditional breeds, and the history of cattle droving in the area, which was at its peak between the 16th and 18th centuries. As part of the project we are requesting stories and anecdotes relating to the keeping of traditional cattle, and to droving.